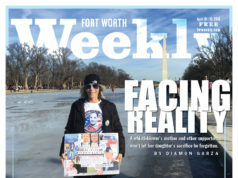 Two Texans discuss politics, fear, and the power of Willie Nelson to bring us back together. I met Beto O’Rourke after hearing him speak at a fundraising event for Texans in Manhattan. The room was hypnotized. Everyone had been instantly impressed. It felt a little like meeting a 2018 Jimmy Stewart. Tall, humble, sincere, and funny, he seems like a person who can do something significant. I asked him for an interview. He said yes. It turned out to be a hard interview to nail down, as he is a seriously busy congressman currently campaigning for a seat in the U.S. Senate. I finally caught up with him earlier this month. It was blazing hot in Brooklyn, but I’m sure it was hotter in Del Rio, Texas. He spoke to me by phone as his kids played in the Holiday Inn pool. 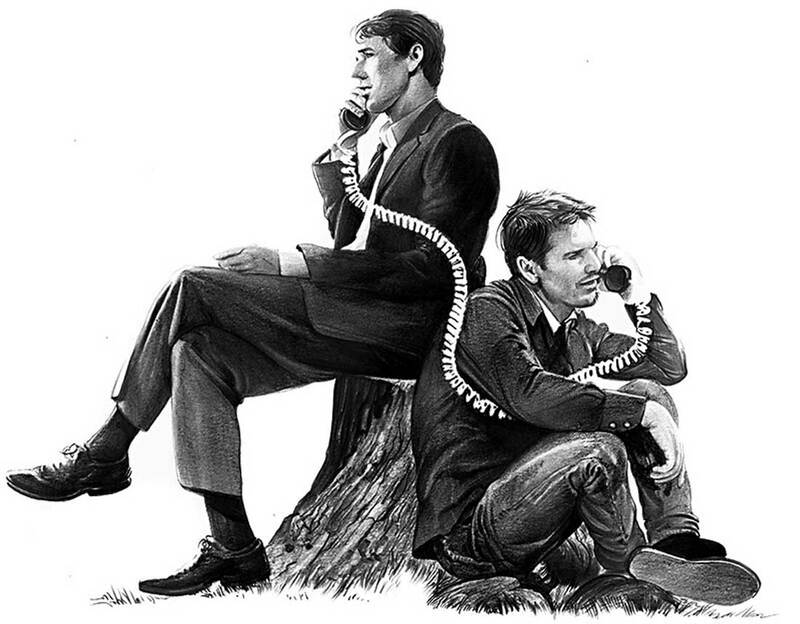 Ethan Hawke: I heard you played with Willie Nelson at his Fourth of July picnic. 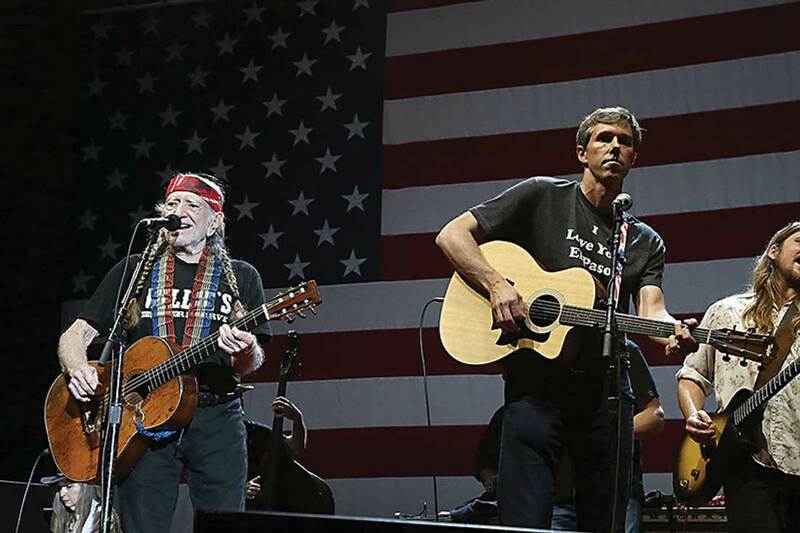 Beto jammed with Willie Nelson at Nelson’s annual Fourth of July Picnic near Austin. Photo by Gary Miller. My first concert was Willie’s Fourth of July picnic in 1976. My dad and I drove from Fort Worth to Austin in a Plymouth Barracuda. I was 6 years old. That’s how you spent the bicentennial! I’ve been following Willie ever since. I went to a Willie Nelson concert here in New York right during the bombing of Baghdad. Bush was president, and the newly past president, Bill Clinton, introduced Willie. It was one of the stranger political experiences of my life because half the audience was cheering wildly, ecstatic to see Clinton, and the other half wanted to take this opportunity to let him know how much they hated him. Seriously, the place practically exploded. Two guys in front of me, grown men, had a full-blown fistfight. But Clinton calmed it down. Clinton said, “Look, I know some of you support me, and I know some of you hate me, but don’t we all love Willie Nelson?” And in that instant, the roof came off the place. And then Clinton said this smart thing, “See, we’re all not as different as we think.” We can all love “Blue Eyes Crying in the Rain.” We are not as different as we are made to feel. I wonder what it would take for an individual in politics to bring us together. So I think if we don’t write people off and we don’t take them for granted, we’re just going to do a whole lot better. My grandfather was a Tarrant County judge and a very serious Democrat, but more than a Democrat, he was a World War II veteran. And he always admired people like George H.W. Bush and that whole “greatest generation” that’s now leaving the planet. I feel like we are missing their leadership. I think as a generation they had their priority as Americans in line and that what freedom means, what democracy means, is, when you get elected, you also have to represent the people who didn’t vote for you. Yeah, especially in the World War II generation, there was such a common understanding of sacrifice and service because every family served in some way. Either you went off to war or someone in your family did. Both JFK and Richard Nixon, who ran against each other in 1961, had served, and neither was going to question either one’s patriotism or whether they were “American.” Of course they were. There is something very polarizing and divisive [these days]. We are missing the ability to come together and say, “Hey, I really disagree with you on this point, but you’re not a bad person.” … I don’t know how our generation is going to get that back. But if we don’t, we’ll lose this country. Because the genius of this place is that, 240 years in, you can still come together in a peaceful way and choose the direction we’re going to take. It is just becoming more contentious. It’s getting harder to do that. The Congress and the government are as dysfunctional as they’ve ever been. I worry at some point people are just going to give up on this … and that’s my greatest fear. Me too. Sometimes it feels like we are witnessing a slow-moving coup. I told someone I was going to my 254th county visit to Gainesville in Cooke County and they said, Oh, that was Truman’s last whistle-stop [on his presidential campaign]. Truman said [that] this country was not founded on fear. It was founded on courage, on imagination, and an unstoppable determination to do the job at hand. Sometimes I like to satisfy myself by thinking, “Oh, it’s just this one person who happens to be in the White House,” but it’s not. There is a lot of America right now that, for whatever reason, is fearful. A wall is just an expression of fear. It doesn’t make any sense at all. But I don’t want to write anybody off, and if people are afraid, I want to understand what it is and how we can meet that fear in a way that is in the best traditions of this country. 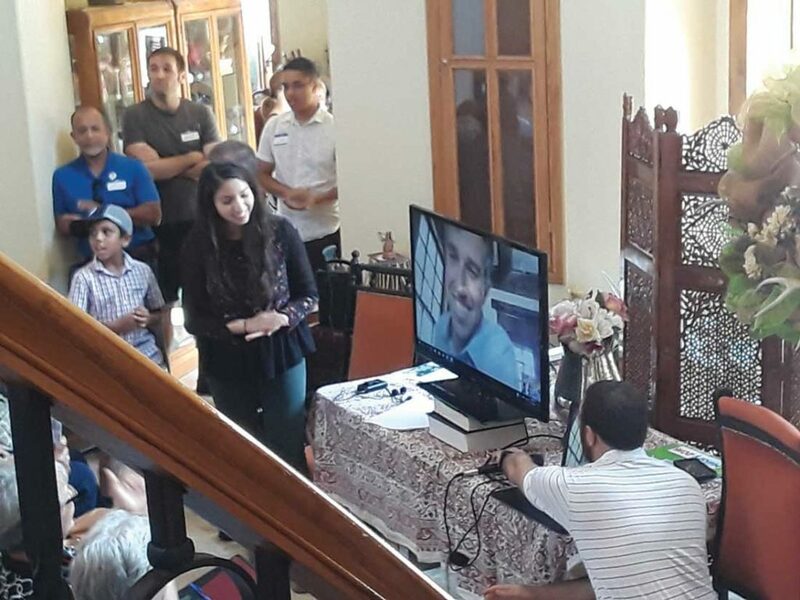 For its inaugural event in August 2017, DFW for Beto was treated to a Skype call from O’Rourke. The essence of what you are saying is that listening to each other is the start of the healing process. A new collection of Nelson Mandela’s letters just came out, and it’s amazing. He taught himself Afrikaans in jail, so he could better understand where his prison guards were coming from. He never wrote anybody off. These are the guys who wanted his whole race under an apartheid regime. He took the time to read books in their language, to understand the way they were raised, what made them think that it was all right to do that to him. And by doing that, he woke them up, and they saw his humanity, and they then listened to his ideas. That made it possible, but it’s not possible if we don’t listen to each other. Yes, that’s right. And it’s frustrating. It’s a really slow process to have a democracy, but it’s the best thing we have going on the planet. We lose that ability to compromise and listen and understand each other at our peril. What I love about Texas is that we have a lot of heavyweights in our history who left their imprint on America. As a fellow Texan, I’m wondering, do you hold any heroes close in your mind? I’ve got a lot of them! You were telling me about going to see Willie Nelson in ’76 with your dad. I was born in ’72, and my dad was county judge of El Paso from ’82 to ’86. He was just as independent as he could be and had an amazing joy in life and in being with people, which from my perspective as a kid was that he was always going to do the right thing and damn the consequences – political or otherwise. He was listening to Willie Nelson and having fun and drinking Coors in the backyard, and I have great memories of growing up and politics just being fun and not being about who you were against and not being pissed off and angry and paranoid. It was about having fun, so he is for sure my hero. El Paso has this long line of underdog heroes. There is this African-American doctor, Lawrence Nixon, who couldn’t practice medicine in East Texas, where he was from, and moved to El Paso. … Blacks could not vote, so he took this case all the way to the Supreme Court twice, and he won it. And El Paso became this outpost of civil rights over the next 50, 60 years. Thelma White was an 18-year-old woman who graduated from the all-black Douglass High School in El Paso in ’54 and tried to enroll at Texas Western College. She was rejected [because of her] race. She hired on Thurgood Marshall, and they took the case to the federal bench in Texas and ended up integrating higher education. And all that’s related to Don Haskins [head coach for Texas Western College, later the University of Texas at El Paso] in ’66. He starts an all-black starting five that goes on to win the NCAA men’s basketball championship, which is the only time Texas, to this day, has won an NCAA men’s championship. People say, with such a huge Hispanic population in Texas, why hasn’t Texas gone the way of California? California is always blue, and Texas is always red, and yet their populace is similar. What could get the Latino population out and voting and believing in the power of politics? OK, so here we are in Del Rio, and later I’ll be in McAllen and Brownsville and then in Houston, which is the most diverse city in the country right now. And yet we don’t punch our weight. We are 49th in voter turnout in the country. In many ways, we have similar demographics to California, but Texas’ also have some of the vestiges of being part of the Confederacy and the reconstruction that followed and the Jim Crow laws. We are 49th in voter turnout in large part on purpose –– [due to] the way that people have been drawn in and drawn out of congressional districts. … They call it “packing and cracking,” [the way they] distribute African-American and Latino votes. They concentrate white votes enough to tip the scales. It is why … a Latina has never occupied one of those congressional seats, even though we are 41 percent Mexican-American. It’s crazy. I love that story about going to the concert in ’76. My dad had a 1974 Toyota Land Cruiser that was new, and in the tape deck he had Waylon and Willie, and that just became part of my consciousness. It’s what I grew up doing. I remember your telling me that your family was political, but I didn’t know your grandfather was a county judge too. When my grandfather came back from World War II, he was part-owner and manager of the Abilene Blue Sox and the lead sports writer for The Abilene Reporter-News, so he covered his own games. Like you said about your dad, he was furiously independent. He voted for Carter and then he voted for Reagan and then he didn’t vote for Clinton the first time but he did the second time. Before he died, his big passion was Obama, and it was very interesting for him because the Blue Sox was a farm team for the Brooklyn Dodgers, and he was selected as a scout to seek out the first black major league player, and that’s actually what took him into the fights with the Klan and then brought him into politics. I was just in Abilene yesterday. We had a town hall at the Paramount Theatre. Nearly 800 people came out. Here it is supposed to be this conservative, red community, but what I found is that if you just show up there, people will show up as well. They’ll give you a chance to share what you have to say, and then they’ll share what’s on their mind. There are good people out there. I love the story about Branch Rickey and Jackie Robinson. You probably know this, but Kurt Russell played for El Paso’s minor league team, the Sun Kings. There’s this great photo of him with a big wad of something in his cheek, and he’s got the El Paso jersey on. 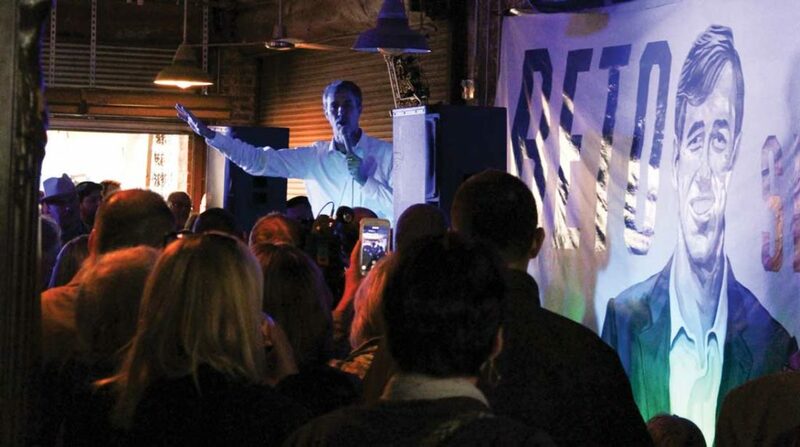 More than 100 folks showed up for Beers with Beto, a campaign event in February at Shipping & Receiving Bar. Photo by Edward Brown. I just worked with Kurt’s son, Wyatt Russell, and I asked Wyatt what his father was like, and his face just beamed with pride. The world is full of so much negativity – it was so wonderful to see a young man, a remarkable young man, really proud of his father. OK, here’s my last question for you: Meeting you back in April, what I was really struck by is this natural humility you have. Being an actor, I know you can’t fake that. It’s very effective and wonderful to be around. But it makes me worry a little about you, in politics. What happens to people? I mean, how can you stay sane and keep that humility if you win? Well, she’s my answer to that. And our kids too. They bring you back down to earth. It’s like, hold on a second. They could care less about Ted Cruz or what we are doing in the campaign right now. It’s hard to do this with little kids, but it also continuously grounds you and reminds you who you are doing it for. I think we have a really good chance to win this, but if we don’t, we’re still going to do our best to help in whatever way we can, and we’re still going to have each other. I think, whatever you can do to make sure you never take yourself or your situation too seriously, that’s the key. And for me it’s Amy and the kids who help me with that. Sounds like you won already. 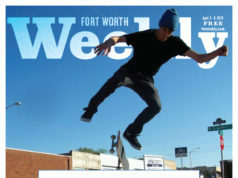 A version of this story originally appeared in The Austin Chronicle. Texas better keep Texas in the RED and not get on the path of no return with Democrats. Once Democrats in, they stay in. They have been wanting to control Texas for years, don’t let them. Texas would look like a twin cousin of Mexico, law enforcement at the border would cease to exist, your streets would be totally infested with drugs and crimes. Vote out all Democrats on every ballot. Vote especially for Ted Cruz en masse. He has supported our President from day 1 which really surprised me considering how brutal the campaign was. Cruz is TEXAS. Beto is Mexico. 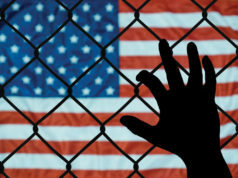 Beto will cater to those illegals at the border while Cruz will protect you from them.